That Donald Trump is a grand disruptor when it comes to international affairs is now a commonplace observation in the establishment media. By snubbing NATO and withdrawing from the Paris climate agreement, we’ve been told, President Trump is dismantling the liberal world order created by Franklin D. Roosevelt at the end of World War II. “Present at the Destruction” is the way Foreign Affairs magazine, the flagship publication of the Council on Foreign Relations, put it on its latest cover. Similar headlines can be found on the editorial pages of the New York Times and the Washington Post. 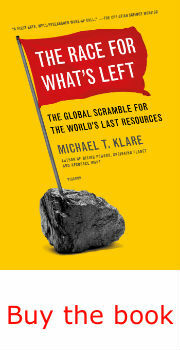 But these prophecies of impending global disorder miss a crucial point: in his own quixotic way, Donald Trump is not only trying to obliterate the existing world order, but also attempting to lay the foundations for a new one, a world in which fossil-fuel powers will contend for supremacy with post-carbon, green-energy states. This grand strategic design is evident in virtually everything Trump has done at home and abroad. Domestically, he’s pulled out all the stops in attempting to cripple the rise of alternative energy and ensure the perpetuation of a carbon-dominated economy. Abroad, he is seeking the formation of an alliance of fossil-fuel states led by the United States, Russia, and Saudi Arabia, while attempting to isolate emerging renewable-energy powers like Germany and China. If his project of global realignment proceeds as imagined, the world will soon enough be divided into two camps, each competing for power, wealth, and influence: the carbonites on one side and the post-carbon greens on the other. As noted in Foreign Affairs, this is a very different perception of the international system than that of then Wilsonian internationalists, who still see a world divided between liberal democracies (led by the U.S. and its European allies) and illiberal autocracies (led today by Vladimir Putin’s Russia). Surprisingly, it is no less distinct from the disjointed global system portrayed by disciples of the late Harvard political scientist Samuel Huntington, author of The Clash of Civilizations, who portrayed a world divided along “civilizational” lines principally distinguished by a clash between Islam and the Judeo-Christian West. Trump clearly has no patience with the first of these models and while he’s certainly exploited anti-Islamic sentiment during the election campaign and in his first months in office, he does not appear wedded to the Huntington thesis either. His loyalty seems to be reserved solely for states that produce fossil fuels, while his disdain is largely directed at countries that favor green energy. How you view the world — which of these visions you embrace — truly matters when it comes to shaping American foreign policy. If you favor a Wilsonian view (as do most American diplomats), your primary objective will be to bolster ties with Great Britain, France, Germany, and other like-minded democracies while seeking to limit the influence of illiberal autocracies like Russia, Turkey, and China. If you uphold a Huntingtonian outlook (as do many of Trump’s followers, advisers, and appointees), your goal will be to resist the spread of Islamist movements, whether they are backed by Shiite-majority Iran or Sunni-majority Saudi Arabia. But if, like Trump, your view of the world is largely governed by energy preferences, none of these other considerations matter; instead, you will lend your support to nations that embrace fossil fuels and punish those that favor the alternatives. The vigor with which Trump is pursuing this grand scheme was on full display during his recent visit to the Middle East and Europe, as well as in his decision to withdraw from the Paris climate accord. In Saudi Arabia, he danced and dined with oil-drenched kings, emirs, and princes; in Europe, he dismissed and disrespected NATO and the green-leaning European Union; at home, he promised to eliminate any impediment to the expanded exploitation of fossil fuels, the planet be damned. To critics, these all appeared as separate manifestations of Trump’s destructive personality; but viewed another way, they can be seen as calculated steps aimed at bolstering the prospects of the carbonites in the forthcoming struggle for global mastery. Step one in this process was to revitalize the historic U.S. alliance with Saudi Arabia, the world’s leading oil producer. For decades, it was the cornerstone of American policy in the Middle East, aimed at preserving a conservative political order in the region and ensuring American access to Persian Gulf oil. President Obama had allowed the alliance to fray by raising the unwelcome issue of human rights and negotiating with Iran over its nuclear enrichment program. Trump journeyed to Riyadh in May to assure the Saudi royals that human rights concerns would no longer be an irritant in their relations and that Washington would join them in their drive to combat Iranian influence in the region. “We are not here to lecture,” Trump insisted. “We are not here to tell other people how to live, what to do, who to be, or how to worship. Instead, we are here to offer partnership.” As part of this “partnership,” he signed a $110 billion arms sales agreement with the Saudis. Expected additional sales over the coming decade could bring the total to $350 billion. Many of these arms, once delivered, will be used by the Saudis in their brutal air campaign against rebel factions in Yemen. The Saudis claim the rebels (mostly Houthis from the country’s barren north) are receiving weapons from Iran, thereby justifying their own attacks, but most observers agree that such Iranian aid is limited at best. In the meantime, the Saudi strikes are taking a heavy toll on civilians and helping to create a humanitarian crisis that has contributed to a severe outbreak of cholera and threatens famine on a massive scale. While in Riyadh, Trump also discussed closer ties between American energy firms and the Saudi oil industry, largely controlled by that country’s royal family. “The two leaders stressed the importance of investment in energy by companies in both countries, and the importance of coordinating policies that ensure the stability of markets and an abundance of supplies,” Trump noted in a joint statement with Saudi King Salman. Step two in this process was the enfeeblement of the NATO alliance and the European Union (EU) — most of whose members are strong supporters of the Paris climate agreement — and the improvement of U.S. relations with Russia, the world’s number two oil producer. So far, President Trump has been unable to make much progress on the second of these goals, thanks to the ongoing uproar in Washington over allegations of Russian meddling in the 2016 presidential election, but he achieved spectacular success in the first during his May 25th visit to NATO headquarters in Brussels. He even crossed up his own advisers by switching speeches at the last moment and refusing to commit himself to NATO’s mutual defense agreement. He refused to reassure its members of Washington’s commitment to the “one-for-all, all-for-one” principle embedded in Article 5 of the NATO Treaty, obliging all member states to come to the aid of any member under attack (although he would later made an explicit commitment to that article during a White House press conference). In addition, he hectored them about their failure to devote adequate resources to the common defense. Other American presidents have offered similar complaints, but never in such a disdainful and dismissive manner, guaranteed to alienate key allies. On top of this, he appeared to differ with senior NATO officials over the threat posed to the alliance’s solidarity by Russian cyber attacks and political meddling, downplaying their significance. Trump then proceeded to further alienate Europe’s leaders at the final stop on his trip in Taormina, Sicily, for a meeting of the G-7 top economies. According to news reports, the Europeans, led by newly elected French President Emmanuel Macron and German Chancellor Angela Merkel, sought to convince him of the urgency of remaining in the Paris climate accord, stressing its importance to Euro-Atlantic solidarity. “If the world’s largest economic power were to pull out, the field would be left to the Chinese,” Merkel warned. But Trump proved unyielding, claiming job promotion at home outweighed environmental considerations. “Now China leads,” said a dejected Macron, a comment that may prove prophetic. Step three was President Trump’s formal announcement of a U.S. withdrawal from the Paris agreement in a Rose Garden ceremony on his return to the White House. As it currently stands, that agreement would require significant reductions in U.S. emissions of carbon dioxide and other greenhouse gases (GHGs), principally through curbs on the combustion of fossil fuels. To fulfill such obligations, President Obama pledged to constrain GHG emissions from electrical power generation through his Clean Power Plan that, if fully implemented, would have severely diminished the domestic use of coal. He also mandated improvements in the efficiency of petroleum-fueled vehicles. In repudiating the pact, Trump hopes, against all odds, to breathe new life into the domestic coal industry (currently suffering from intensified competition from natural gas, wind, and solar power) and reverse the trend toward more fuel-efficient cars and trucks, thereby increasing the demand for oil. When speaking of the abundant energy reserves he seeks to develop, Trump was not, of course, referring to the nation’s limitless wind and solar potential, but rather to its oil, coal, and natural gas supplies. He bragged about how coal mines were already “starting to open up” again and emphasized his plans to eliminate all restrictions on drilling for oil and natural gas on federal lands. It will undoubtedly take years of rule-writing, judicial maneuvering, and negotiations with Congress and the international community before the White House can fully achieve such pro-carbon objectives. Still, the steps already announced ensure that regulatory impediments to increased fossil fuel consumption will be lifted and incentives of all sorts for the installation of renewable energy obliterated. And keep in mind that these are only the first steps the president is considering. Ultimately, he seems to be aiming at the creation of a new world order governed largely by energy preferences. From this perspective, an alliance of Russia, Saudi Arabia, and the United States makes perfect sense. As a start, authoritarian-minded leaders who detest liberal ideas and seek to perpetuate the Age of Carbon now run all three countries. They, in turn, exercise a commanding role in the global production of energy. As the world’s three leading producers of petroleum, they account for about 38% of total global oil output. The U.S. and Russia are also the world’s top two producers of natural gas. Along with Saudi Arabia, they jointly account for 41% of global gas output. In addition, each of the three is closely linked to other major oil and gas producers: in the case of the U.S., Canada; for Saudi Arabia, the Persian Gulf sheikhdoms (including tiny Qatar with its giant natural gas fields which, at this very moment, the Saudi royals are trying in a draconian fashion to dominate and subjugate); and for Russia, the former Soviet republics of Central Asia. All of this only adds heft to the hydrocarbon dominance of this potential trilateral alliance. When oil and gas output from all of these countries, including Azerbaijan, Kazakhstan, Kuwait, Oman, Qatar, Turkmenistan, and the United Arab Emirates, is added to that of the Big Three, the resulting combine controls approximately 57% of world oil output and 59% of its natural gas production. Given that petroleum is still the world’s most valuable trade commodity and that oil and gas together account for 60% of the world’s combined energy supply, this represents a stupendous concentration of economic and geopolitical power. The U.S.-Saudi arm of this alliance is already strikingly in play. Trump had clearly expected to make equal progress on Russia on entering the White House, though his own missteps (and those of his close associates, including his son-in-law Jared Kushner) have impeded that effort. Soon after taking office, members of his staff instructed the State Department to begin exploring ways to lift economic sanctions on Russia (originally imposed after that country’s annexation of Crimea) that have prevented greater cooperation between U.S. and Russian energy companies. “There was serious consideration by the White House to unilaterally rescind the sanctions,” Dan Fried, chief American coordinator for sanctions policy until late February, told Yahoo News. These efforts were stymied when it became known that Trump’s newly appointed national security advisor, Michael Flynn, had spoken privately with Russia’s U.S. ambassador, Sergey Kislyak, about sanctions relief during the campaign, and lied about it in conversations with Vice President Mike Pence and others. Nevertheless, Trump has made no secret of his belief that the furor over Russian links to his campaign organization is unwarranted and that the country’s interests would be best served by significantly improved ties with Moscow. And lest there be any question about the triangular nature of this incipient alliance, Russian President Vladimir Putin met with Defense Minister Mohammed bin Salman, the Saudi deputy crown prince, in Moscow just a few days after Prince Mohammed met with Trump in Riyadh. “Relations between Saudi Arabia and Russia are seeing one of their best stages at the moment,” said the prince, reported Tass, Russia’s state-run news agency. As with Trump’s visit to Riyadh, energy cooperation was a key feature of the Russo-Saudi dialogue. “Agreements in the energy sphere are of high importance for our nations,” Putin declared. There are, of course, many obstacles to Trump’s plan for a petroleum-based trilateral alliance. Although Russia and Saudi Arabia share many interests in common — particularly in the energy field where both seek to constrain production in order to boost prices — they also differ on many issues. For example, Russia supports the Bashar al-Assad regime in Syria, while the Saudis want to see him ousted; likewise, the Russians are major arms suppliers to Iran, a country the Saudis seek to isolate. Nevertheless, Putin’s meeting with Prince Mohammed in the wake of Trump’s visit to Riyadh suggests that these are impediments that might be overcome. In his famed 1993 “Clash of Civilizations” essay, Samuel Huntington wrote that “the fault lines between civilizations will be the battle lines of the future,” with the divide between Islam and the West the most conspicuous among them. Many of Donald Trump’s supporters rabidly adhere to just this view, but not Trump himself (though he is obviously no friend to Muslims). By building an alliance of fossil-fueled states, Islamic countries included, Trump hopes to bolster the strength of pro-carbon forces globally. Ironically, his antics aimed at weakening the power of any incipient future green alliance have so far had a boomerang effect, encouraging potential future green powers to bolster their collaborative linkages and forge ahead more forcefully in dominating the planet’s alternative energy future. In this sense, he seems to be creating a self-fulfilling prophecy by pushing the green states closer together. Recall Merkel’s comment to Trump at the G-7 summit. If the U.S. were to pull out of the Paris accord, she said, “the field would be left to the Chinese.” Trump did indeed pull out, and Merkel wasted no time in turning her sights on China. Five days later, she hosted the Chinese prime minister, Li Keqiang, for talks in Berlin. He then flew on to Brussels to confer with leaders of the EU. Mutual pledges to uphold the Paris climate accord were said to be a prominent feature of these discussions. India is also seeking to join the A-team of leading green powers. Once considered a stumbling block to any Paris agreement thanks to its partiality for coal-fired power plants, India is now making giant strides in the development of renewable energy. According to the respected environmental website Carbon Tracker, India is now expected to obtain 40% of its electricity from non-fossil fuel sources by 2022, eight years ahead of schedule. In the process, it is already cancelling many of its plans for new coal-fired plants. That India is moving rapidly to assert leadership in the development of green energy has also caught the attention of Germany’s Angela Merkel, who invited Indian Prime Minister Narendra Modi to Berlin in late May for two days of talks on enhanced economic cooperation. It is still early days, but the outlines of a potential new global order seem to be emerging, with the fossil-fuel states battling to preserve their dominance in an era in which an ever-increasing share of the world’s population is clearly going to embrace green energy technology (and the massive job-creation machine that will go with it). The events of just the first few months of Donald Trump’s presidency already give us ample food for thought on the emergence of a new bipolar energy planet, including a willful attempt to cripple NATO; a so-far-abortive effort to forge a U.S.-Russian alliance; Washington’s embrace of Saudi regional hegemony; and the emergence of a possible Chinese-German alliance. Keep your eyes open for further developments along these lines. One thing is clear: everyone on the planet will be affected by the ways in which such reshuffled alliances and rivalries will play out. A world dominated by petro-powers will be one in which oil is plentiful, the skies hidden by smog, weather patterns unpredictable, coastlines receding, and drought a recurring peril. The possibility of warfare is only likely to increase on such a planet, as nations and peoples fight over ever-diminishing supplies of vital resources, especially food, water, and arable land. A world dominated by green powers, on the other hand, is likely to be less ravaged by war and the depredations of extreme climate change as renewable energy becomes more affordable and available to all. Those, like Trump, who prefer an oil-drenched planet will fight to achieve their hellish vision, while those committed to a green future will work to reach and even exceed the goals of the Paris agreement. Even within the United States, an impressive lineup of cities, states, and corporations (including Apple, Google, Tesla, Target, eBay, Adidas, Facebook, and Nike) have banded together, in an effort dubbed “We Are Still In,” to implement America’s commitment to the climate accord independently of what Washington says or does. The choice is ours: allow the dystopian vision of Donald Trump to prevail or join with those seeking a decent future for this and future generations.